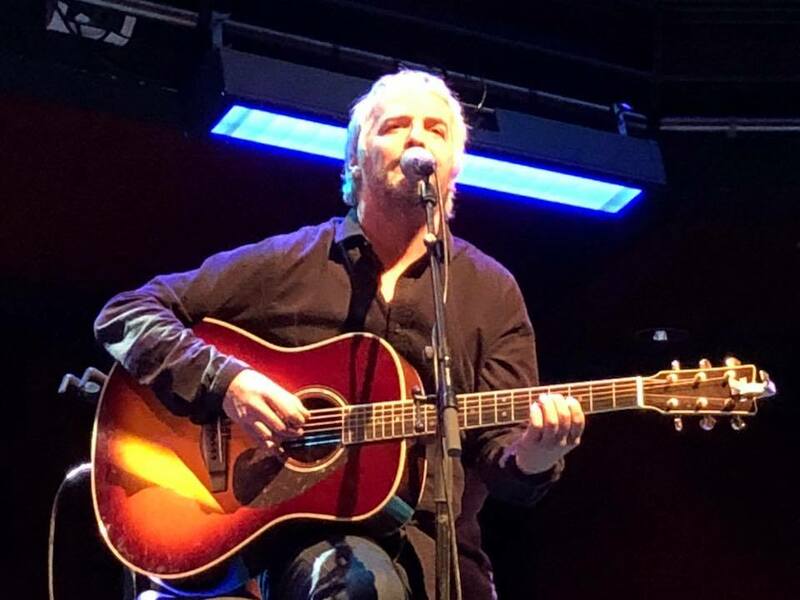 With the soft release of his new album Leave Alone The Empty Spaces John Bramwell has been touring the UK and the Netherlands for the past few weeks presenting the songs from it and its follow-up as well as tried and tested I Am Kloot favourites. 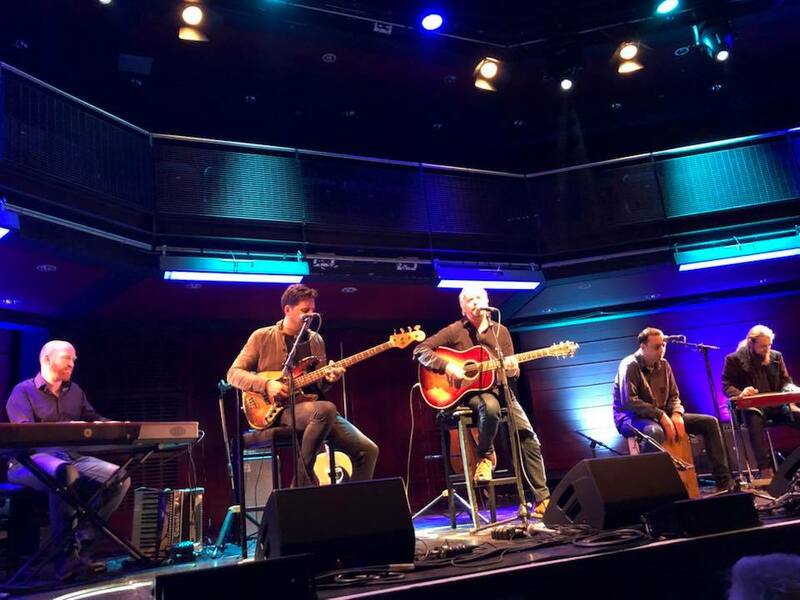 We caught the train up to the splendid Sage 2 in Gateshead to witness the rejuvenation of one of the country's favourite songwriters. Dave Fidler has been opening shows for John for what now seems like an eternity and as John has often said it's simply because he's so bloody good. He later plays in John's band, but his half hour solo set shows why he's become so beloved of John's fan base. 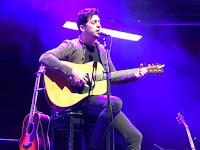 Mixing songs from his debut album I'm Not Here with a series of new songs from his second album that demonstrate a real progression and an impressive breadth and depth to his songwriting. He opens with Love And Electricity, one of the new songs, and it's immediately obvious that the new material has that comforting emotional warmth running through it that characterised much of I'm Not Here. 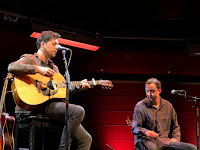 He's joined by his brother Andy for a couple of songs, one of which Can't Stand It is one of his songs that Dave has reinterpreted and the other Easy Gone Easy Come, about the death of their father and the birth of Dave's son Dylan, has particular resonance. He finishes his set with a cover of Last Night I Had The Strangest Dream, a song that he heard Dylan and his classmates sing at school on Remembrance Day, a song he admits to not having known beforehand. It's a fitting close to the set, with Andy back on stage singing harmonies, as Dave draws much of his inspiration from heroes of the past, but brings them right into the here and now. The Sage audience love him and rightly so. 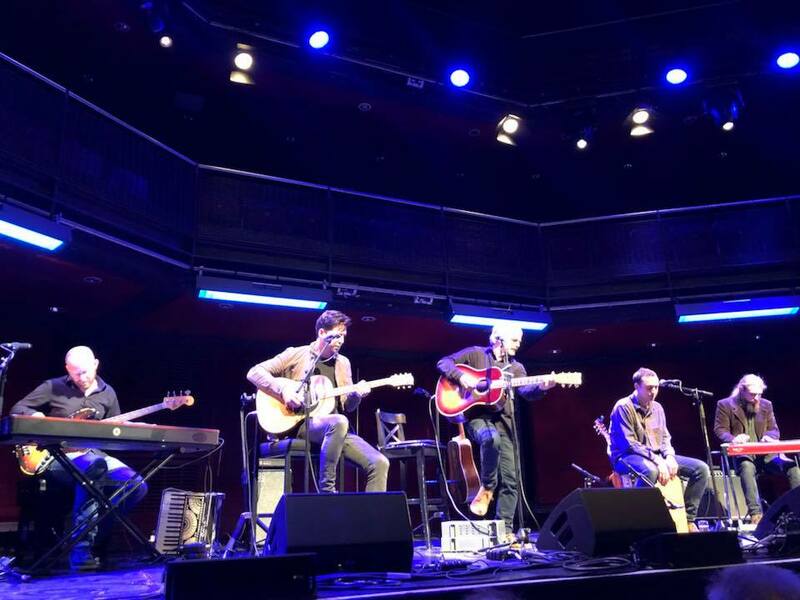 The Sage 2 is equally a magnificent venue as its bigger sister under the same roof. Designed for acoustic perfection it's the ideal venue for both John's new songs, from his debut solo album Leave Alone The Empty Spaces as well as a selection from his as yet unreleased follow-up, which he performs with a band consisting of Dave and Andy Fidler, pedal steel guitarist Adrian and his trusty sidekick Alan Lowles who plays keys, accordion and guitar as much as for a trip through I Am Kloot's back catalogue which is mostly played solo. He opens the set with his new band and the title track from Leave Alone The Empty Spaces and it's immediately clear that the rejuvenated John Bramwell that Dave refers to earlier is very much alive and well. He makes an entrance after the rest of the band, declaring this to be his "Elvis intro." 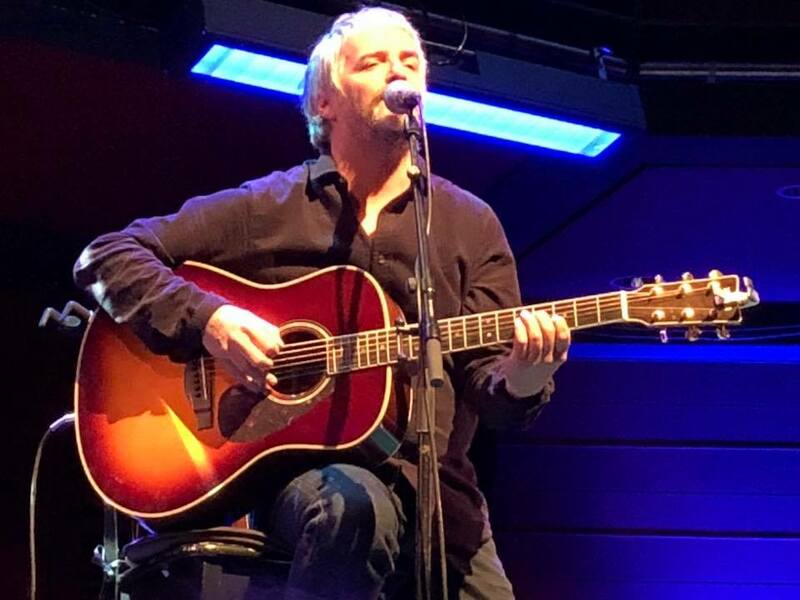 There's a warm restlessness of spirit to the new material that delights those who've been through thick and thin with John during his time with Kloot and before that and thirty years on from him emerging in the pre-Madchester fog as Johnny Dangerously, he's writing and recording the best material of his life. He's also on good form, chiding Dave for having over-eaten at the Indian restaurant before the show. Accentuated by the room's acoustics and the exemplary attention of the audience, it's a perfect introduction and a statement of intent that this show is about looking forward rather than looking back. Of course it'd be almost impossible to ignore a back catalogue the scale of which John possesses, and his setlist, scribbled down five minutes before he came on stage and then placed on the floor out of his sight as he jokes with us, takes us on a journey through it, from Bigger Wheels from Kloot's debut Natural History to their final album Mouth On Me, stopping at most places in between. These songs are at that most poignant and beautiful stripped right back down the way they are here, proving the old adage that less is most definitely more. Every little piece of uncertainty, insecurity and damning self-assessment is exposed in these hushed reverent surroundings, accentuated by the crystal clear sound of the room. 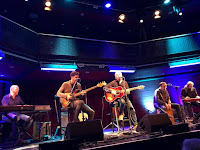 Interspersed in between classic Kloot favourites as I Still Do, 86 TVs, Bullets, Fingerprints and Gods And Monsters are some more of the new songs that suit the solo style rather than the band. Meet Me At The Station, the final song on Leave Alone The Empty Spaces, is possibly his most beautiful song to date, a cautious warm optimism and hope emerging from the darkness whilst Time's Arrow, the album's lead track, is one of those classic Bramwell songs that has garnered him so many accolades from his contemporaries as the country's finest singer-songwriter (a label he no doubt detests). John's on good form, joking about the Val Doonican stool that's replaced his customary beer crate which are getting increasingly hard to source, describing Alan as the "benign controller of the universe", laughing at Dave's earlier comment about the curry and engaging with the audience's random references to prior gigs and obscure song requests. The undoubted highlight of the night though is a series of seven new songs, positioned just before the valedictory double of Northern Skies and Proof. Three songs from Leave Alone The Empty Spaces and four from its follow-up, which embraces a more band-based sound if these are anything to go by. Recent single Who Is Anybody Anyway? is really just a taster for some of the finest songs John has written, but an indicator of the headspace John's currently occupying. 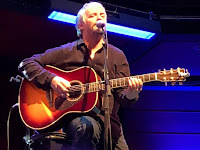 Drenched with harmonies from both Dave and Andy that give the song a lift that Kloot's one voice approach could never summon and you can almost sense John relaxing and enjoying it more than he's ever done before. From The Shore has a delightful waltz-like feel to it that would crack a smile on the hardest face. Working My Mind Off is the first of the unreleased songs and is where the new band approach comes into its own, the pedal steel and cajon creating the platform for some of John's most positive, yet cautiously optimistic, lyrics as he declares "gonna fake it till the people don't appear at my door" and it feels like he's had the weight of the world lifted off his shoulders as evidenced by the huge grin that appears as the song finishes. Sat Beneath The Lightning Tree is softer in tone, but Alan's lilting piano has that piercing effect on the senses which combined with a vocal that's overflowing with a warmth that melts the cold harshness of the night outside. The optimism continues with Get Away From This (Leave No Traces), a poignant song about getting "a slow train to nowhere fast" where you don't "have to care about what people say." That optimism brings with it a richness to John's voice that hasn't often come to the fore before. 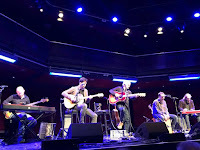 Days Go By is a song that John's particularly proud of as he regales at the end quipping he wrote the line "you hesitate, you meditate, turn your mind off and levitate" sat on his settee with a cup of tea and that if that's all he had from thirty five years of songwriting he'd be happy. This song was slated for Leave Alone The Empty Spaces, but has been held back for the second album and it fits with those around it like a hand in glove. The best of the new ones is kept for last and World Full Of Flowers is possibly the best song John's ever written. Again its theme is escaping the drudgery and mundanity of every day life, lyrics talking of escapism and finding a better place as John declares with a smile "Want to run where the sunset breaks, make beauty for its own sake, see a world full of flowers go sailing by. I’m tired of the white and black, want to get my colours back." It could almost be a metaphor for this new beginning. We're invited to sing along with Northern Skies, John joking that the "na na na" bit is one of his best lyrics and then that it sounds a bit like Hey Jude. The audience, who have been an example of how crowds should respond to gigs like this, let loose as they do on Proof that follows. John then treats us to a completely unplugged No Fear Of Falling, stood at the very front of the stage before leaving to a standing ovation. 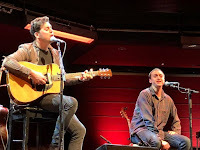 Much gets made when established front men go out on their own, inevitable comparisons are made, but this feels like John has reinvented himself, rediscovered the joy of making and performing music again and the new songs stand up to anything and everything he's done before. He's enlisted the help of some remarkably talented musicians with whom he's clearly struck up a strong bond and that shows too and this transmits itself to a smitten crowd. 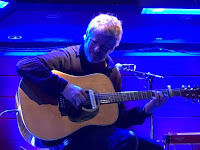 John Bramwell played Leave Alone The Empty Spaces, Bigger Wheels, Mouth On Me, Meet Me At The Station, Masquerade, I Still Do, The Moon Is A Blind Eye, Time's Arrow, Astray, From Your Favourite Sky, Fingerprints, 86 TVs, Gods And Monsters, Bullets, To The Brink, Who Is Anybody Anyway?, From The Shore, Working My Mind Off, Sat Beneath The Lightning Tree, Get Away From This (Leave No Traces), Days Go By, World Full Of Flowers, Northern Skies, Proof and No Fear Of Falling.